Insulation Removal, Installation, And More! 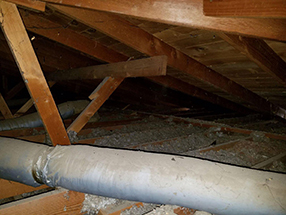 The insulation in your attic provides an extremely necessary service, which is that it keeps the air in your home safely inside. It's able to circulate and keep the temperature steady without the need for your heater or AC to continue running. However, if the insulation in your attic has been harmed in some way, such as by water damage or pests, this will not be the case. If you've noticed your energy spending rising, this may be the answer! Our professionals are ready to come out and get to work determining what the source of your attic's issue is. In some cases, your attic may simply not have enough insulation for the climate you live in. We can add more to it, which should take care of things. If it's not functioning well due to damage, we'll instead remove it safely and have it replaced with all new materials. If you need assistance deciding on what type would be best for you, we can give you a hand! Dust accumulating in your attic is more than just an issue of it being dirty, it can cause all kinds of problems! Mold may begin to grow and eat away at the wood, your ventilation may get clogged up, and it can even pollute the air of your home. Let use clear it all out safely, and get it looking like new again. Aside from being a hassle to get rid of, and meaning you'll likely need the insulation they chewed on replaced, there's more that needs to be tended to after a pest invasion. They leave behind diseased waste that can easily enter your home and cause illness if not taken care of! We can decontaminate the attic to ensure this won't happen. Our technicians can also rodent proof your home afterward to keep it from occurring again. Call Air Duct Cleaning Santa Monica today and let us get to work.